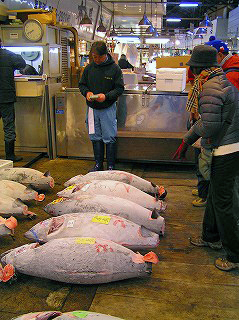 Big tunas lie on the floor at Tsukiji Fish Market for the early morning daily market. Photo from ‘Shin hiking Kawasaki members’ page. Have you ever been to any fish market? In Tokyo, ‘Tsukiji Fish Market‘ is internationally famous where many tourists visit to see the fish auction every weekday very early in the morning. Talking about fish is very difficult because the names of the fish would vary according to countries. The name would change if the shape, colour and size differs, additionally, names could change according to the area where the fish was caught even if the fish is same. To those who are living in the countries without coastline or with few rivers or lakes may not be so familiar with fish. Some may not be interested in identifying different fish by each different name and fish is nothing more than ‘fish’. But in Japan where the land is surrounded by the coastline, people have been familiar with many sorts of fish from the past. According to the ’Sushi Zukan’ (pictorial book of Sushi), at least 321 kinds of Sushi exist in Japan! No wonder we are familiar with the names and the characteristics of different fish. So, in order to define, as much as possible, what sort of fish we are going to write about, we would like to start by asking you a simple question. If you are asked to draw a ‘fish’ freely, how do you draw it? We guess more than 80% of you would draw it like below. The fish that we ‘normally’ eat around the world can be biologically divided only into six groups (or six order (biology)W), among them the largest group is ‘PerciformesW’. Therefore, many of you could have drawn the fish which belongs to this Perciformes group. 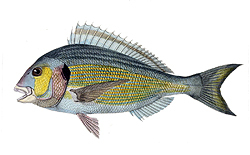 The Perciformes group fish are, for example, perch / spigola / suzuki, sea bream / orata / tai, blue fish / tracuro / aji, mackerel / sgombro / saba, tuna / tonno / maguro, skipjack tuna / palamita / katsuo. In addition, there are milions of fish whose names are not so familiar and it is very hard to distinguish one kind from the others. 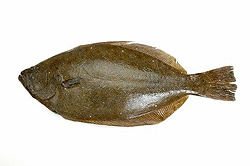 One of the flatfish, the flounder or ‘Hirame’ in Japanese. On the other hand, fish in other groups such as flatfish, salmon and cod will be quite easy because of their unique shapes and the sizes but today we would like to write about one of the fish from Perciformes group, the Sea Bream, the Orata or in Japanese, the ‘Tai / 鯛’. In ancient times when Man’yōshūW, the oldest existing collection of Japanese poetry, was compiled in the 8th century Japan, the fish with the name of Tai / 鯛 had indicated only the Madai / 真鯛　or the Red SeabreamW (Pagrus majorW to be more specific). However, in the book written in late Edo Period, mid 19th century, it said that there were 86 types of Tai / 鯛. Still more, the book written in 1943 says that the numbers of fish resembled as Tai / 鯛 are 235! Tai or Madai, the Japanese Red Seabream. 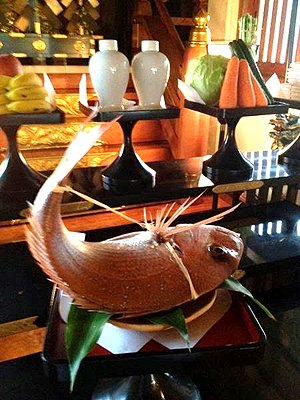 The fish that has been on the celebration table of the Japanese from ancient times. 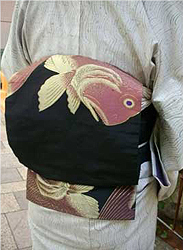 Its’ colour is said to be similar to the colour of the cherry blossoms which may also have been one of the reasons why the Japanese liked this fish on celebration. Thus, even among the Japanese, misunderstandings could easily arise if we just say ‘Tai / 鯛’. However, the name of the fish ‘Tai / 鯛’ would remind most Japanese of red ‘Madai / 真鯛’. 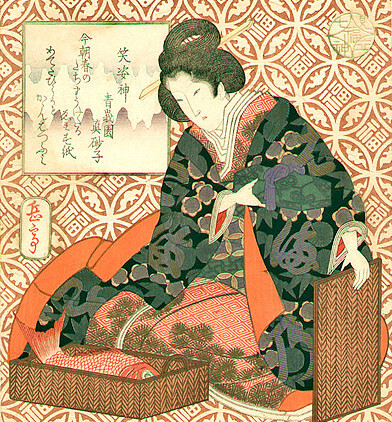 UkiyoeW of Masako Shogaen (or Seigaen) who was one of the popular writer of comic poetry (TankaW), drawn in an image of good fortune goddess. 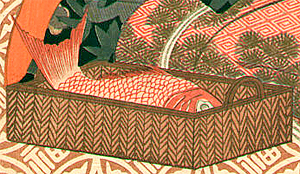 As an image of ‘good fortune’, you can see that Tai is presented in front of her in a basket. Drawn by Yashima GakuteiW in late Edo period. 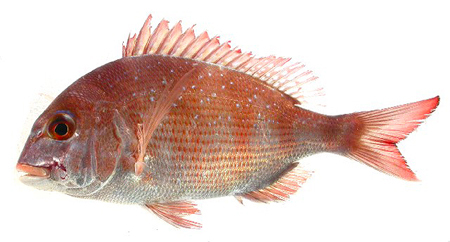 Guilt-headed bream, what the Japanese called ‘black Tai’, the Kurodai. During our research on Tai, we have found that the Sea Bream normally eaten in Europe has been the Gilt-head breamW, what we call ‘Kurodai / 黒鯛 (meaning black Tai)’ in Japanese. However, in Germany, Portugal, Galicia, Spain, France, Italy, Slovenia, Croatia, Serbia and many other countries, the fish is called ‘Orada’ or ‘Orata’, meaning ‘Gold’, while in Japan, Tai is recognized as red fish. There is also an interesting point of view on the fish. 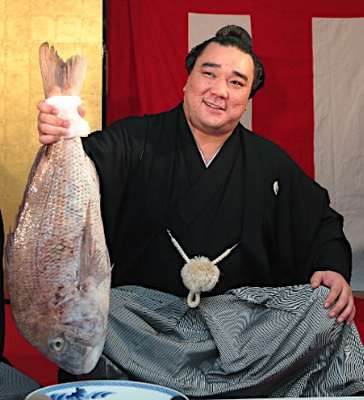 In some countries such as China, France, UK and US that Tai has been recognized as greedy and indecent fish, in fact they are called “snapper”, while in Japan, Tai is the fish, traditionally to be offered to the ShintoW Gods or to be cooked and eaten on celebrations and happy occasions. The different point of view on the fish may have derived from the two different minds of the ancestors’, a hunting tribe or an agricultural tribe. Tai offered on the Shinto alter. Photo from ‘Kawabe Toru-no honki blog‘. Sumo wrestler, Harumafuji, holding a big Tai on his celebration of YokozunaW promotion. Photo from ‘Memorial na MEMO tachi‘. 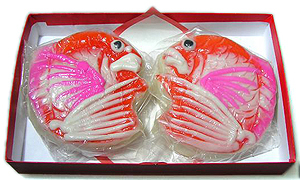 As mentioned above, Tai / 鯛 has been a fish for celebrations and happy events. Many of the Japanese still, with no doubt, prepare this fish on certain occasion, in private or in public, to express or high-lighten the celebration or the happy event. Beautifully made ‘Okuizome’ special menu at Gifu Miyako Hotel. Photo from ‘Gifu Muyako Hotel Official Site‘. A boy on his ‘Okuizome’ celebration. Photo from ‘Studio Alice Official Site‘. 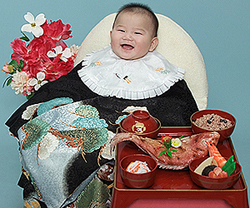 If you ever have a chance to attend a weaning ceremony called ‘Okuizome / お食い初め’ which takes place after around 100 days after a newborn baby in Japan, a special festive menu with grilled whole Tai / 鯛 would be seen at the very start of a Japanese life, may follow on the menu of first ‘Tango Seasonal Festival‘, first birthday and then may be on wedding, special birthday years after 60 as Kanreki / 還暦, Koki / 古希（celebrating 70th birthday) or Kiju / 喜寿(celebrating 77th birthday). 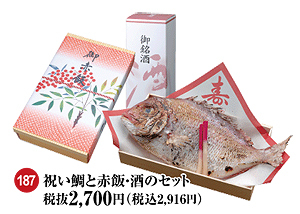 You may see the grilled whole Tai / 鯛 annually if you buy or cook gorgeous ‘Osechi / お節‘ on New Years. ‘Taiyaki’, a baked Tai-shaped cake filled with Anko sold at stall. Also good as a hand-warmer on cold days! Apart from real Tai, you would see ‘Taiyaki / たい焼き (literally meaning grilled or baked Tai)’ which is a Tai-shaped cake with Anko (sweet red bean paste) filling inside sold in stalls on streets, even in some fashionable area as Harajuku, which is thought to have started its sales back in Meiji period as an alternative of ‘Imagawa-yaki / 今川焼き’ which is a short cylinder-shaped baked cake. It is said that the simple Imagawa-yaki changed the shape into Tai because Tai was then an expensive fish that not all the townspeople could afford but wished that they could eat it and get the luck. 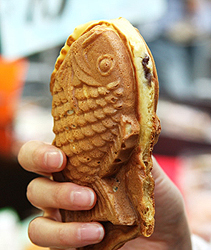 Taiyaki, fulfilled the wish, became one of the popular Japanese sweets then and even of today. 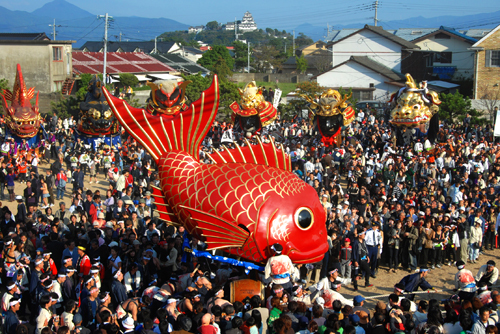 ‘Taiyama’, a popular festival float in ‘Karatsu Kunchi’ festival. Photo from ‘Karatsu Tourist Association Official Site‘. ‘Obi’, a sash for Kimono with Tai drawings! Photo from ‘Tsurezure naru mamani‘. While writing on Tai by ourselves, a single foodstuff as Tai being a symbol of luck and becoming an ingredient to share the luck by eating it, we’ve found it indeed interesting. When we looked for similar overseas culture, we were able to find articles on ‘good luck foods in New Year’ though none of the foods developed into other kinds, like Tai becoming Taiyaki or becoming a festival float as in Karatsu KunchiW or into a motif of decorations. Now then, when and why did Tai become a ‘happy fish’ in Japan? There is an adjective as ‘Medetai / めでたい’ which means ‘happy’ or ‘joyous’. As ‘Japan is a country of pun‘, Tai with the same rhyme with ‘mede-tai’, it is recognized as a happy fish. 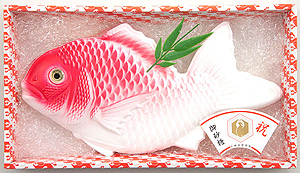 As red has been the **important colour in Japan from ancient times, the red coloured fish also meant important to the Japanese. **cf: For the meanings on red colour, please refer to ‘Meaning of Japanese Stripes‘. Tai is the fish which Ebisu, one of the Seven Gods of FortuneW is holding. Ebisu is the only one of the seven that has the origin in Japan. His origin is Kotoshironushi, the son of Ōkuninushi who is believed to be a god of nation-building. When he was requested to pass over his land by Takemikazuchi, the thunder god, Ōkuninushi told him to go and see his son for the answer. When Takemikazuchi when to see him, Ebisu was fishing on a boat. 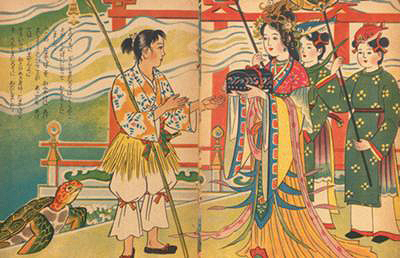 This episode written in KojikiW, Japan’s oldest historical record, strongly influenced the notions of future generations which fixed the image of Ebisu fishing. Ebisu is always described with a fishing rod and a big and red Tai. In ShintoW, big red Tai has been a fish offered to Kami, the Shinto God, from ancient times. In Edo period, Tai was the fish that ShogunW liked the best. 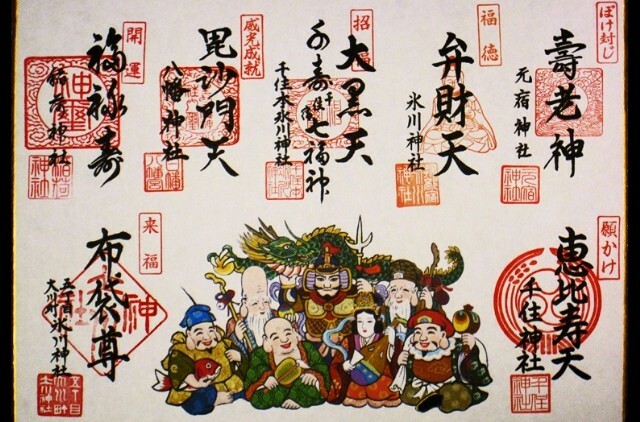 collection of Shichifukujin’s go-shuin, a seal stamp given to worshippers and visitors to shrines and temples. The God drawn on the left is Ebisu. 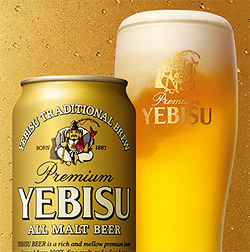 One of the popular beer in Japan, ‘Yebisu Beer’.The trademark of the beer is designed from Ebisu God, holding his fishing rod and big red Tai. Photo from ‘Sapporo Brewery Ltd. Official Site‘. There is a golden rule on serving Tai on the festive occasion or celebration. Tai should be served in a whole with head. Sliced pieces are not recognized as happy, which means that no Japanese would go out to eat Sushi of Tai for celebration. Grilled Tai with festive red rice and rice wine sold in sets at catering site. Photo from ‘Saikokuan Offical Site‘. A whole Tai is usually grilled with salt when served as a celebration dish as in weaning ceremony, wedding, special birthdays and other celebrations. It can also be one of the gifts to take back home for those who attended the event! Deriving from this tradition, there are several areas where sugar made Tai is used instead of real grilled Tai as a gift to the guests on wedding like DragéeW or ConfettoW in western countries. There is also a custom of giving out KamabokoW, boiled fish paste, made into a shape of Tai on wedding for guests especially in Toyama PrefectureW. ‘kamaboko’ made Tai. Photo from ‘Amanoya Official Site‘. Finally, a part of the Tai bone was recognized to bring happiness! Tai has a pair of bones which looks like the shape of Tai itself. These bones are called ‘Tai no Tai’, literally meaning Tai of Tai. These bones can be found near the gills, where pectoral fin joints are. If you ever have a chance to eat grilled whole Tai, try to find the bones and take them out without breaking. If you succeed to take them out without breaking, you will get a luck! This has been some sort of a game after having eaten whole Tai on festive occasions since Edo period to be sharing the luck of the event as well as fortunetelling. Once you took out the bones, keeping them in your purse are believed to bring you luck on fortune! ‘Tai no Tai’. Try to find them in grilled Tai! Photo from ‘Soyokaze tsushin‘. There are two possible reasons on why Tai has been called ‘Tai’. As Tai is a flat and that the adjective for flat in Japanese is ‘hiratai’ remained as its’name. As Tai” was recognized as elegant fish which has delicate taste, the taste was described as ‘Tai-i’. ‘Tai-i’ meant “high rank”. Talking about how Tai is written in KanjiW, Chinese character used in Japanese, let us talk about a small tip on Kanji first. Most of the Kanjis concerned on fish have the left side of ‘魚’ which means ‘fish’. We found out that nearly 200 Kanjis with ‘魚’ on the left side of the Kanji characters! The right side of the Kanji, on the other hand, relates to the actual meaning. Look at the Kanji on the right which is a Kanji for Tai. The right side part is ‘周’ which means ‘around’ or and ‘surrounding’. As Tai is the fish which can be found in every sea surrounding Japan, the 周 was selected. There was a very smart military strategist, named Jiang ZiyaW, who served King Wu of ZhouW, written as ‘周武王’ in Kanji. When King Wu found Jiang Ziya, he was fishing. The king wanted to hire him as the military strategist but he made the King wait for his reply until his fishing finished. On fishing, Jiang Ziya used a barbless hook or without any hook, believed under his theory that the fish would come to him of their own volition when they were ready which was also his philosophy for the military strategy. As this episode was so famous, the Kanji ‘周’ was used for the meaning as the fish of Zhou dynasty. If you want to know about the culture of a country in depth, we think that the language has the key. In a country where there are no coastlines, the word ‘fish’ may never or is rare to be used in the proverbs in the language. Among all sorts of fish, Tai is recognized as the King of the fish and it is used for ‘something valuable’ in idiomatic phrases. We guess it is something very irregular to ‘global standard’. Here are some examples of the idiomatic phrases in which Tai is used. Literally meaning : Tai is Tai even if it is rotten. A good horse becomes never a jade. Gold remains gold, though it lies in the mud. Literally meaning : Catch Tai with a shrimp. Literally meaning : Better be the head of a sardine than the tail of Tai. Literally meaning : Dancing of Tai and flounders. This is a very famous phrase used in a Japanese fairy tale, ‘Urashima TarōW’. The story is about a fisherman named Taro Urashima who saved a turtle which was being ill-treated by children on the shore. Few days later, a big turtle came to thank him for saving the turtle from the children, invited him to their Dragon King’s Palace under the sea. Taro accepted the offer and down he went under the sea, to the palace where he was entertained by the gorgeous dishes and the dance of Tai and flounders, spending his time there for seven days. When he returned up to shore he couldn’t find anyone he knew. At a loss how to act, he opened a box which the Dragon Princess gave to him as a present even though he was told not to open it. A wisp of smoke came out from the box and turned Taro into an old man, making him realize that one hundred years had passed while he stayed in the Palace under the sea!! Taro given a present from the Dragon Princess on his depatrue. Can you see waiting maid that is likely to be Tai? Picutre from an old childrens book from ‘bokete,jp‘. The ceremonial elegance and splendor of the Palace is expressed with ‘the dance of Tai and flounders’. If the dancing fish were whales or dolphins, we presume that they would not have given the elegant effect as Tai and flounders to the Japanese. Going through a rough sketch of Tai in relations to the Japanese, don’t you feel like meeting live Tais, kept in good care under the nature not so far from Tokyo? The bay, full of wonder, is located on the East coast of Boso peninsulaW in Kominato,　Kamogawa,ChibaW. This is the place where NichirenW, a Buddhist monk was born about 800 years ago. 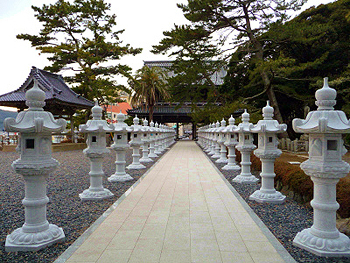 **For those who want to know more about Nichiren, please refer our past article, ‘Kuon Temple‘. The legend says a miracle happened when he was born at this place. Thousands of Madai (Japanese red seabream) popped up from the surface of the sea together with thousands of lotus flowers blooming at all once. Since then, this bay has been called ‘Tai no Ura / 鯛の浦 – the Bay of Tai’ and Tai of this bay thought to be sacred. Local residents have carefully protected and strictly forbidden fishing. They have fed them even after the great Tsunami or even during the war while they had hard times feeding themselves! 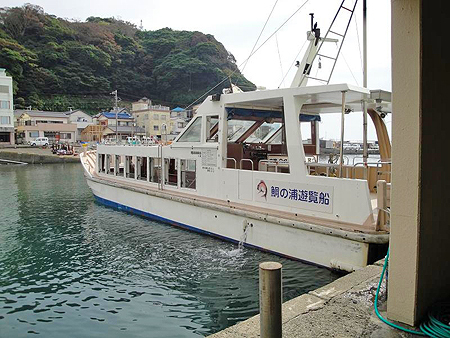 Wild swimming Tais of Tai no Ura can be seen on sightseeing boat! Apart from the religious belief, it is said to be a miracle because that the Tai can be found in the shallow water, approximately 10-20 meters (33 – 66 ft) deep, which is too shallow when regarding Tai nature of living in deep sea. The reason of this phenomena has not yet been solved scientifically. “Tai no Ura” was designated as a Special Natural Treasure of Japan in 1967. Sightseeing boat from the port for you to see Tais! Photo from’ Garemayu-san no tabi memo‘. 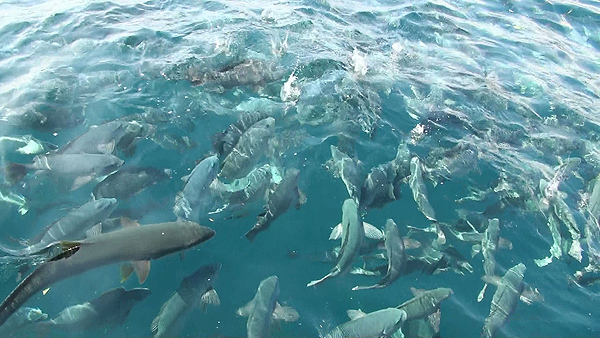 You can see the school of Tai swimming near the surface on an excursion boat that sails every 30 minutes or so from the bay. You will be amazed at the sight when aged boatmen who are in a traditional fishermen’s jackets throw the bait into the sea. A thirty-minute cruising in not a modern atmosphere, in fact rather ‘retro’, with traditional Japanese folk back ground music is very unique and fun. Special memorial service held on every 18th of January is for all the Tai which were accidentally caught in nets held in the sea. Brith place of Nichiren, now Tanjo-ji temple. Photo from ‘FOLDING BIKES TRIP‘. Very near to “Tai no Ura”, there is a temple called [W Tanjō-ji] which was established in 1276 for a worship of the birth of Nichiren. (‘Tanjō’ means ‘birth’ in Japanese). After the establishment, the temple was unfortunately destroyed several times by an earthquake, tsunami and a fire. In the late 20th century the reconstruction of the temple was completed thus the current fascinating building is quite new but the perfect reproduction of its original style. On the 6th day of every month, here again, a memorial service for Tai is held at 9 o’clock in the temple. The Tanjō-ji temple was chosen as one of the ‘100 Most Fragrant Landscapes’by the Ministry for the Environment for the well combined refreshing scent of the sea and the incense of the temple. Take Tateyama Expressway and get off at Kimitsu IC. Go on Prefectual Road 92, then to Boso Skyline (free of charge), followed by Kamoga Toll Road. Continue on the Prefectual Road 24 to the direction of Kamogawa / 鴨川. At the crossing with Sotobo Kuroshio Line / 外房黒潮ライン, turn left. Keep going for about 10km, passing by Kamogawa Sea World, turn right at the crossing Nichiren / 日蓮交差点. Take Sotobo Tokkyu View [Wakashio] Line of JR from Tokyo Station to Awa-Kominato / 安房小湊. From the station it will take about 20 minutes on foot. Address : 183-8 Kominato, Kamogawa-shi, Chiba Pref.